In the evening of September 17, the Syrian province of Latakia came under a large-scale aerial attack, which targeted a power station as well as two facilities belonging to the Syrian military. There were also reports on air strikes in other parts of the country but they were not confirmed. The Syrian state media said that the missiles came from the sea adding that a high number of them was intercepted. However, according to photos and videos, unknown number of missiles hit their targets. Pentagon spokesman Navy Cmdr. Sean Robertson officially denied the US involvement in the attack. On September 18, the Russian Defense Ministry revealed that the attack was carried out by four Israeli F-16 warplanes. Furthermore, during the attack a Russian Il-20 surveillance plane with 14 servicemen on board disappeared over the Mediterranean Sea. 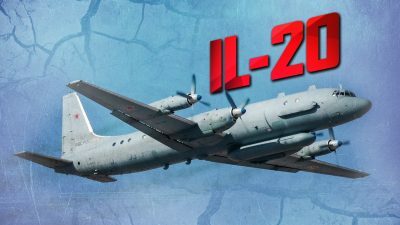 The ministry said that “the plane was returning to the airbase of Khmeimim, 35 kilometers from the coast of Syria” when “the mark of IL-20 went off” from radars. “At the same time, the Russian radars fixed missile launches from the French frigate Auvergne, which was in that area,” the defense ministry added. Later, the Russian Defense Ministry added that the IL-20 plane was accidentally targeted by a Syrian S-200 missile. The incident was a result of the intentional actions by Israeli warplanes, which were hiding from the Syrian fire behind the IL-20. A search and rescue operation is ongoing. The IL-20 surveillance plane is an Electronic Intelligence (ELINT) platform, equipped with a wide range of antennas, infrared and optical sensors. It’s interesting to note that September 17 strike on Syria came just a few hours after Russian President Vladimir Putin and Turkish President Recep Tayyip Erdogan agreed to establish a “demilitarized zone” between militants and government troops in the Syrian province of Idlib. “We’ve agreed to create a demilitarized zone between the government troops and militants before October 15. The zone will be 15-20 km deep, with full withdrawal of hardline militants from there, including the Jabhat Al-Nusra [now known as Hayat Tahrir al-Sham],” Putin said following face-to-face talks with his Turkish counterpart. All heavy weaponry, including battle tanks and artillery, should be withdrawn from the zone before October 10. The zone will be patrolled by Turkish and Russian forces. It’s expected that roads between Aleppo and Hama, and Aleppo and Latakia must be reopened for transit traffic before the end of the year. According to Putin, the agreement has a “general” support from the Damascus government. However, it’s still unclear how it’s possible to demilitarize a 15-20 km deep zone mostly controlled by Hayat Tahrir al-Sham and its allies without employing a military option to force these militant groups to obey.